Dutch Colonial farmhouse built in the early 1700s. Both carved date of 1747 found on an old barn beam and the rubble stone construction of the house place it in this early period. 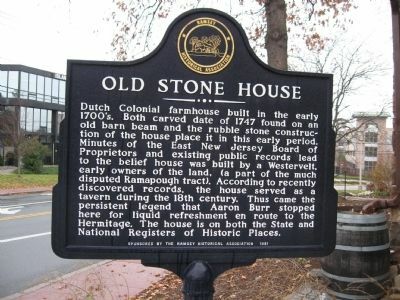 Minutes of the East New Jersey Board of Proprietors and existing public records lead to the belief house was built by a Westervelt, early owners of the land, (a part of the much disputed Ramapough tract). According to recently discovered records, the house served as a tavern during the 18th century. Thus came the persistent legend that Aaron Burr stopped here for liquid refreshment en route to the Hermitage. The house is on both the State and National Register of Historic Places.